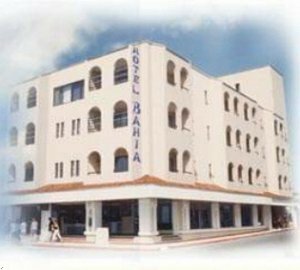 Hotel Bahia is ideally located in the heart of downtown Cozumel, it overlooks the beautiful Mexican Caribbean Sea, and it's surrounded by restaurants, boutiques, dive shops and local entrtainment. 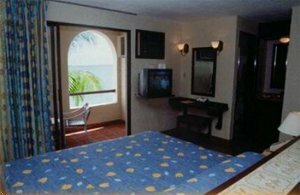 All rooms with kitchenettes, ocean front suites are available. Standard guest room with king bed and double bed, or two double beds. Room includes full bathroom, balcony, iron/board, refrigerator, kitchenette, dishes/cookware, coffee/tea maker, business style desk, and mulitple closets. From the airport, take Antonio Gonzalez St west, off road into Rafael Melg Ave south, hotel is located almost in front of the International Ferry. Hotel address is Ave Rafael E.Melgar x 3 Sur. * Lobby Bar - Open 11am-7pm, casual, drinks and snacks. * Open Air Restaurant - Open 7am-10:30am, casual, buffet breakfast.